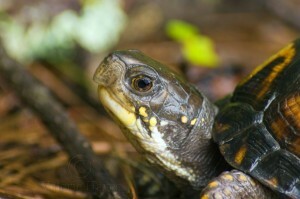 A collection of quotes about turtles. Why? Because I like them. 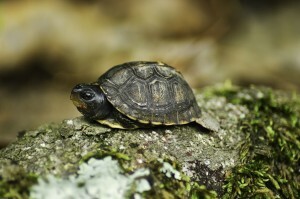 A female box turtle in her habitat in Georgia. -Archie Carr, from the essay “The Cold-Blooded Fraternity”, collected in his book A Naturalist in Florida. “As I held the formless object in my hand and meditated on it, half ready to admit that I had never seen it move and never would, the front lobe of the plastron lowered slightly. 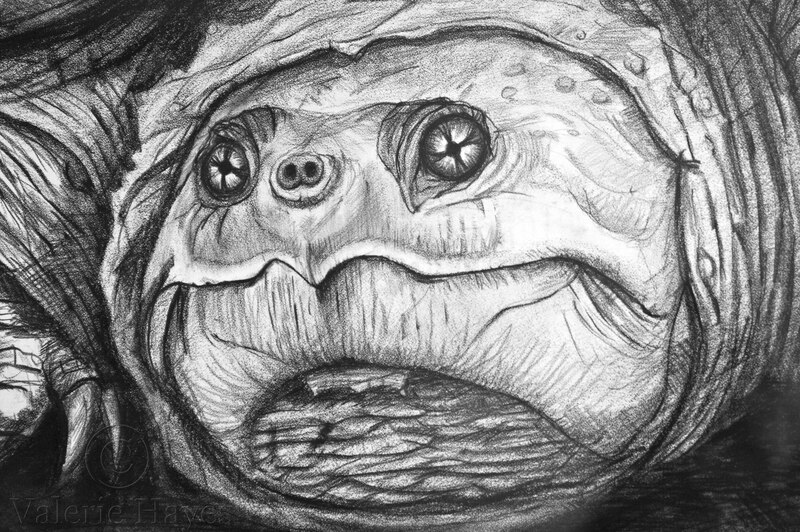 This was an unmistakable symptom of curiosity, meaning not merely that the creature was alive but that he fermented with an extroversion uncommon in his kind. 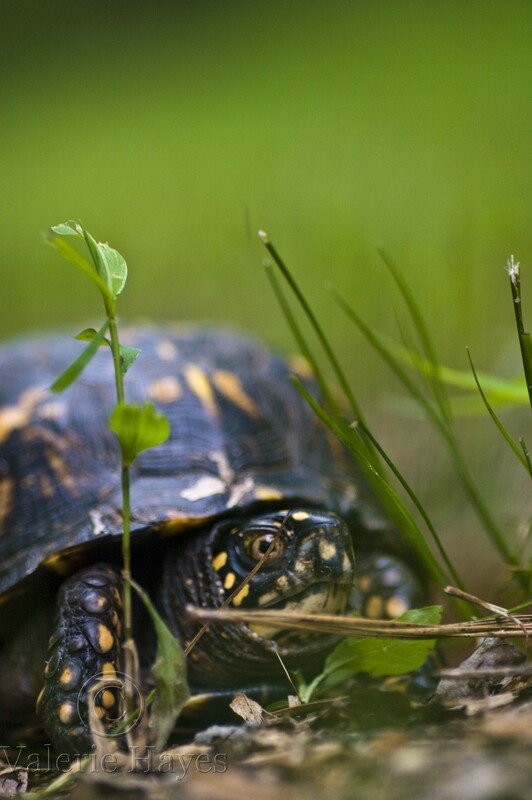 I set him aside and watched. Shortly, a scarred beak appeared, and then the head slowly emerged and rose as the long neck stretched, and my gaze was met by that of a pair of clear amber eyes, bright and unperturbed and unclouded by any memory of past tragedy or fear of tragedy to come. -Archie Carr, from the essay “Sticky Heels”, collected in his book A Naturalist in Florida. 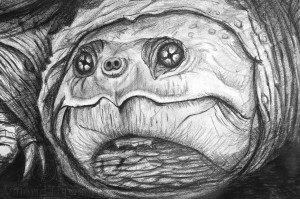 Detail of a 22″x30″ drawing of a large female snapping turtle, by yours truly. “The Cenozoic came, and with it progressive drought, and the turtles joined the great hegira of swamp and forest animals to steppe and prairie, and watched again as mammals rose to heights of evolutionary frenzy reminiscent of the dinosaurs in their day, and swept across the grasslands in an endless cavalcade of restless, warm-blooded types. Turtles went with them, as tortoises now, with high shells and columnar, elephantine feet, but always making as few compromises as possible with the new environment, for by now their architecture and their philosophy had been proved by the eons; and there is no wonder that they just kept on watching as Eohippus begat Man o’ War and a mob of irresponsible and shifty-eyed little shrews swarmed down out of the trees to chip at stones, and fidget around fires, and build atom bombs. 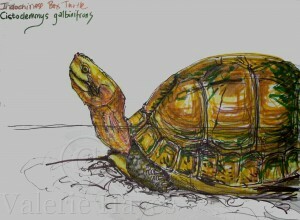 Marker pen sketch of an Indochinese Box Turtle by yours truly. 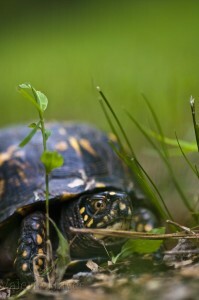 A box turtle photographed while digging her nest in GA. Your gait’s between a stagger and a sprawl. As to your feet, they’d make an angel weep. ‘Tis true you take them in whene’er you sleep. A certain firmness — mostly your backbone. You lack — excuse my mentioning it — Soul. I’d rather you were I than I were you. And “Take your time” the word, in Church and State. 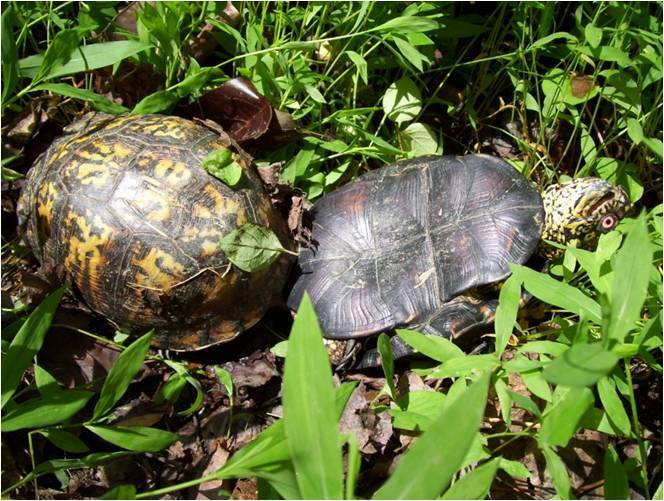 Two box turtles (Terrapene carolina) mating in the woods in Georgia. A juvenile Box Turtle (Terrapene carolina) on a moss and lichen-covered log.